In making all of the games for this show, I wait for some sort of unifying story to suggest their visual appearance. I want them to be Art first and Games next, but still play well. Ideas arrive. Could the playing pieces be clay bottlecaps? Trompe l’oeil nuts? Huge faux jewels? Whatever form they became, there needed to be 24 of them for Checkers – with a few doubles for the Kings – and 32 of them for a second game, Turkish Draughts. 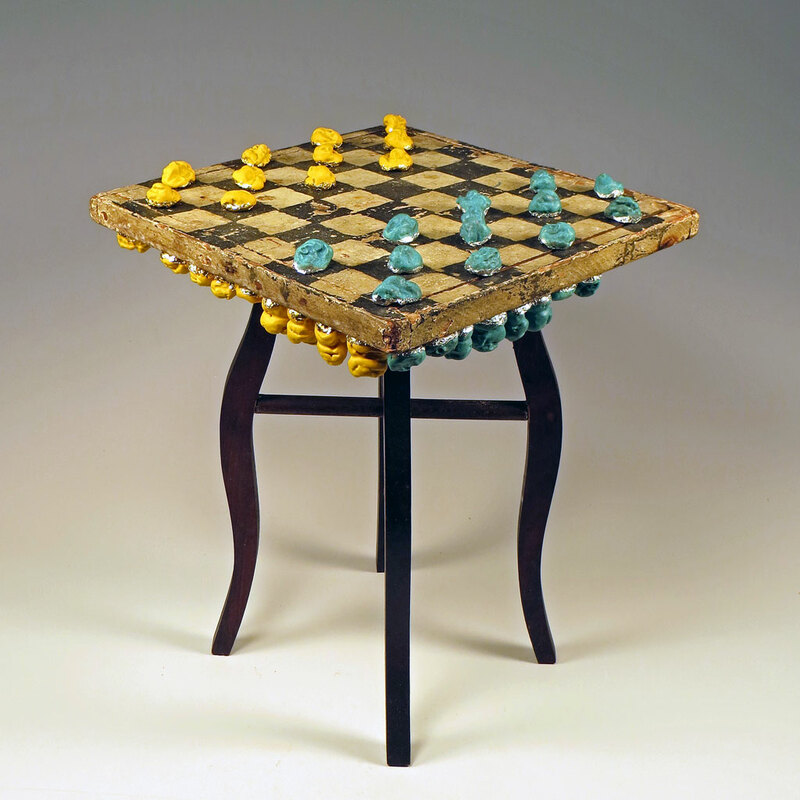 Gummo’s eventual gumwads evolved directly from the wabi sabi “tableness” of the 1930s vintage oak checkerboard itself. If one has gumwads to play with, that’s a totally fun start, but soon the question arises: if one has gumwads and a cool game table, where do ya think they could be stored? An exciting idea is one thing, excellent execution is another. Just what do big wads of casually chewed and discarded gum look like? How big? How shiny? I googled images, bought a few packs, and got to work, even though I’m not much of a gum enthusiast. It wasn’t necessarily hard (that came later,) just specific: how can I achieve that perfectly random garden-variety gumwad look with clay? Molds? Tools? Pinching? Then I nailed it. I began chewing my clay. Let me tell you this: chewing clay, even small balls exceedingly briefly, is gritty, gaggy and gross work. I could only manage 3 or 4 a day, aiming for 40 – of which 16 would be stacked into 8 doubles. I think I got impatient towards the end, backed my ears and spit out the final 10 or so. Suffering for my art, but having amazingly clean teeth as a result. Add some satiny bubblegum glaze colors, countersunk earth magnets, and foil wrappers to finish. Install thin metal strips on the underside edges of that checkerboard table and you’ve got Something Beautiful you can also play with. –Liz Crain, who really likes the incidental dingleball effect the upside down pieces create and wonders if any of you will notice an anomaly in this piece.